In stock -This product will ship today if ordered within the next 1 hours and 43 minutes. 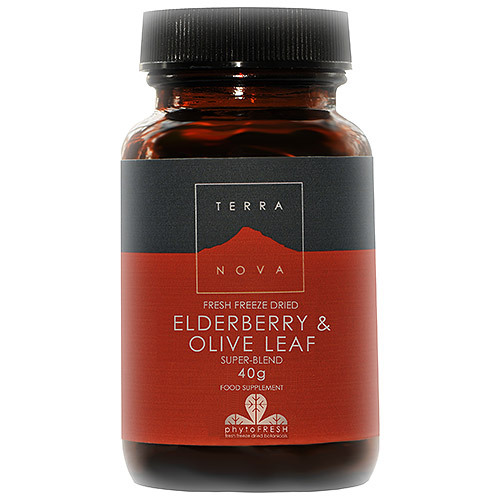 TERRANOVA Elderberry & Olive Leaf Blend helps supports a healthy immune system. It contains elderberry fruit which has made this a popular product. Elderberries are a rich source of vitamins A and C, which are crucial in helping the body maintain optimal health. Olive leaf exhibits considerable immune supportive and antimicrobial activity, warranting its common use in assisting the body`s ability to combat bacteria, viruses and yeast/fungi. Elderflower may help encourage bronchial secretions and perspiration. Below are reviews of TERRANOVA Elderberry & Olive Leaf Blend - 40g by bodykind customers. If you have tried this product we'd love to hear what you think so please leave a review. Best health product ever! Cleared a huge infection in 12 hours! A must have around the house.